The ideal date stamp for your "big" messages. This large stamp allows for up to 10 lines of customised text with 5 above and 5 below the date. The dimension of the complete impression is 85 x 55 mm with a date size of 4 mm The date band includes date, month and 12 consecutive years. To further extend the life of your stamp, order the suitable replacement ink pad 6/511/2 blue/red or single coloured pads 6/511 available in black, blue, green, red and violet. Dry felt pads are suitable for special inks. 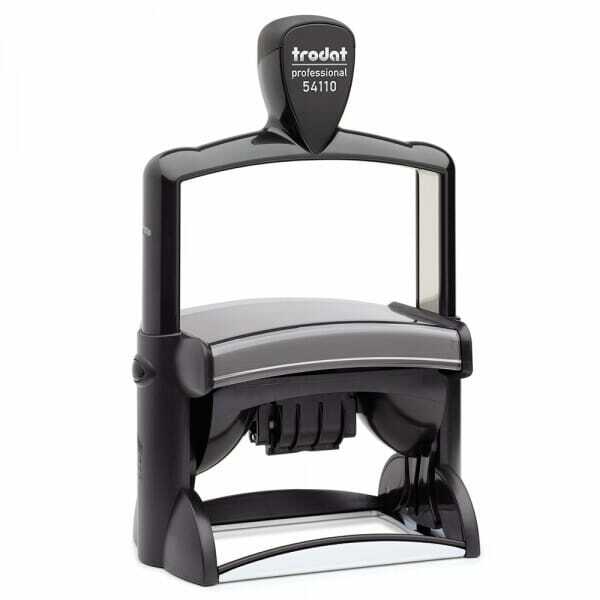 Customer evaluation for "Trodat Professional Dater 54110 85 x 55 mm - 5+5 lines"